GAMECARDS AWARDED ELECTRONICALLY OR IN PAPER FOR SAFETY AND WELLNESS CRITERIA. Fun scratchoff gamecards are collected and traded for weekly safety behavior as well as completing a Health Risk Assessment, Personal Health Tracker, or Wellness and Safety education quiz. The cards reveal points and one letter in the word JACKPOT. EMPLOYEES TRADE THE CARDS ONLINE OR PHYSICALLY. Once they have enough points saved up... 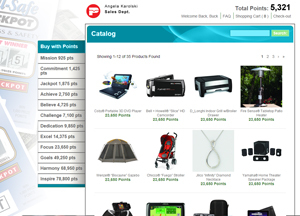 They submit their order and we ship their brand name merchandise reward directly to their home. If they trade and spell the word Jackpot, they win bonus points and get their name entered into huge national drawings. WE HANDLE ALL THE PROMOTION. Custom newsletters, posters, kick-off materials are all included at no additional cost. This keeps the troops motivated! It is an easy program to administrate, and it is a true incentive to employees. In short, the program literally runs itself, and had a huge bottom line impact to our safety costs and our employee satisfaction. The excitement level alone that the program has generated among the employees is worth every bit of it. 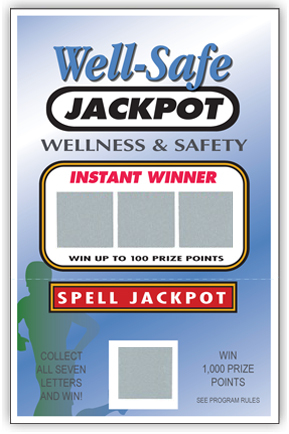 Yes we have both Safety and Wellness Jackpot programs available in an On-Line Version and the ‘ole “classic” paper scratch off version. Here is a secret...if you combine both Safety and Wellness together you can kill two birds with one stone! This means you double the speed of your return on investment. Often companies are already addressing safety issues... In addition, they are also motivated and intrigued by the Wellness movement. After all.. We are all desparate to lower health care costs right!? The fact is, a problem exists. 99% of Wellness programs on the market often take 3 to 5 years to actually impact health care costs and premiums. The current national statistics tout the fact that every dollar invested in a Wellness program can indeed return $5 in savings. Thus, Wellness companies everywhere are promising positive ROI... But ... They don’t tell you WHEN. We are finding that companies wanting to lower their health care costs are having great success by combining the two. Safety provides measurable results and short term proven return on investment. These extra profits often end up paying for the entire wellness side as far as budgets go. The wellness part of our program educates and engages employees in wellness behavior which starts impacting the bottom line big time in just a few short years. Ask us to give you a demo on our WellSafe Jackpot product today!